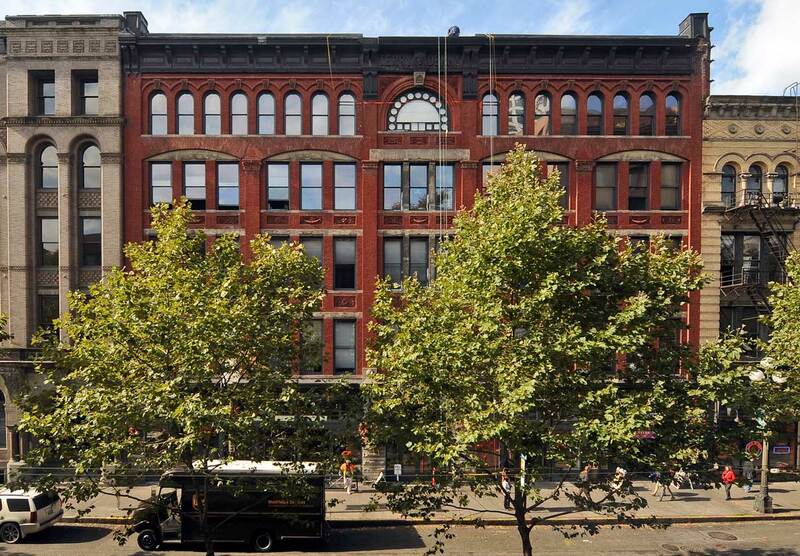 The Terry-Denny Building, named for two of Seattle’s early Euro-American settlers, Charles Terry and Arthur Denny, was constructed following the Great Fire of 1889 and completed in 1891. Most likely because it was built mid-block on First Avenue South, between Yesler Way and Washington Street, it is not so noted as the grand structures at the corners. But it is a Victorian delight and reminds me of the ornamented brick architecture I have enjoyed from the top deck of a red bus while bumping along the Strand in London. The brick-and-stone structure was better known in its earlier years as the Hotel Northern. Its upper floors were closed off a few years after World War II, as they were in many structures in then-down-and-out Pioneer Square. That unwittingly saved them for later restoration. 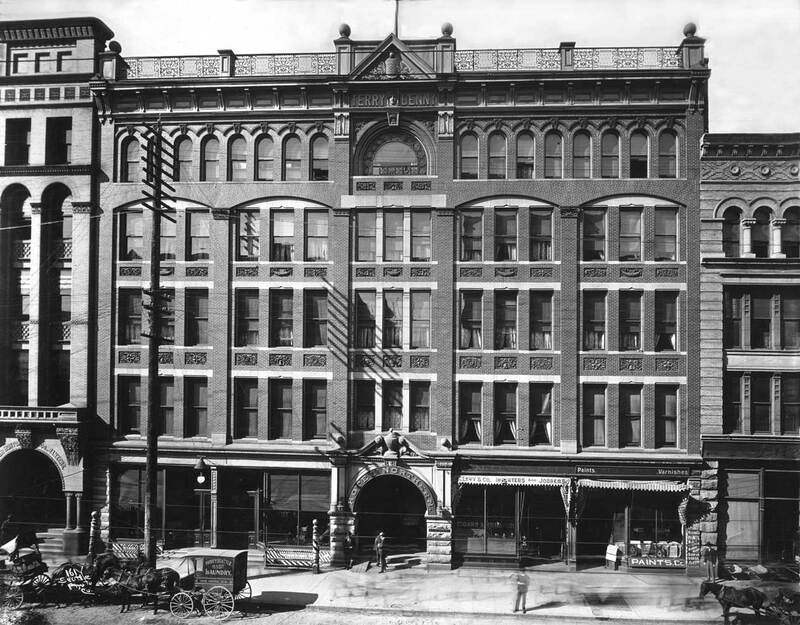 THEN: The Terry-Denny Building, better known in its earlier years as Hotel Northern, was part of the grand new Pioneer Place (or Square) neighborhood built up in the early 1890s after the old one was reduced to ashes by Seattle's Great Fire of 1889. NOW: Jean Sherrard gained entrance to the second floor of another post-fire building across First Avenue South to record this view of the restored Terry-Denny building with the trim address, 111 First Ave. S.
Do you know if this is the building that had the basement luncheonette called the Pittsburgh Lunch? how the patches old and new, were a polished history for future generations to make up their own stories. is where Maynard became “Doc” when the store became a hospital in 1863.
by Edward M. Sammis from New York State. gave Kikisboblu the name Angeline. and twelve inch thick on the fourth. mill and whether they could smell the burnt linseed oil in the tongue-and-groove floor decking? but you can still smell it when it rains. as well as all her pretty paintings. is still upstairs in the reception of Jones & Jones Architects, Landscape Architects and Planners, Ltd.
that Wednesday on May 8th in 1901? The Globe Building, original name Marshall Walker Building, was designed by William E. Boone for Ebenezer Marshall and Cyrus Walker in 1890 on Piner’s Point. Restoration architects: Jones & Jones. Grant Jones, FASLA and Ilze Jones FASLA, AIA. A block from here across Occidental Park was the famous Duwamish Village of 8 longhouses each about 60 feet by 120 feet, called in Lushootseed, Djicjila’letc (djee-djee-lah-letsh) ”little crossing over place,” home to 200 people. “Dzee-dzee-Lah-letch” was the largest village on Elliott Bay and home of Si’ahl, Chief Seattle, warrier, orator and head of both the Duwamish and Suquamish Tribes.